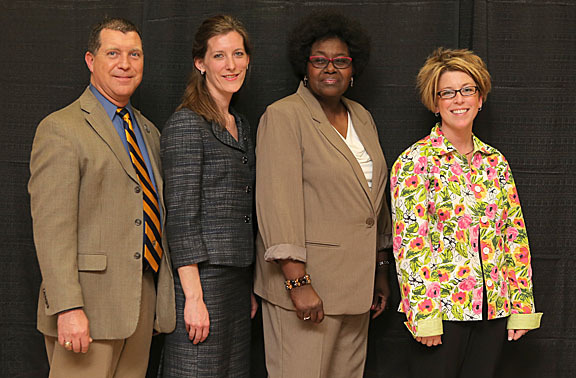 Four employees received the University’s 2014 Outstanding Staff Awards last week. More than 30 nominees were honored at the UT Annual Awards Ceremony. Taking home Outstanding Staff Awards were, from left, Paul Casmus, Deirdre Jones, Beverly Mayo and Ginny York. In a change of format, winners were not selected from each union and employee association at the University. “We changed the format this year to recognize staff for career accomplishments, leadership and services to the University community, and for making a positive and professional impact with students or patients regardless of what employee group or union their position may belong,” Meghan Rayfield, consultant in Human Resources and Talent Development, said. This entry was posted on Thursday, May 1st, 2014 at 3:45 am and is filed under Business and Innovation, Law, Medicine and Life Sciences, News, UT Health, UToday .